Standing since 1432, Schloss Schrattenthal is one of the many palaces that dots Vienna's skyline. It has some gorgeous towers on which you can gaze over the vineyards around the castle. This palace was the setting for the introductory talk, a wine tasting session and a fun cook-your-own-schnitzel lunch on Day 1. Passed down through different hands over time, the castle has now been with the Schubert family for 80 years. They have painstakingly restored large parts of the palace on their own to make it the beauty that it is today. Three generations of the family live at the palace and it is given out as a venue as well as for visitors who may like to stay. The Schuberts make for lovely hosts and joined our table for the lovely Wiener schnitzel lunch we made ourselves. The senior couple will regale you with stories of their backpacking trip in North India in the 70s and will tell you have their family have restored the palace with single minded dedication, with quite a bit of the work done with their own hands, especially the landscaping! Schloss Schrattenthal has landscaping that is simplistic and in keeping with the surrounding green lushness. It also has stone towers with rickety wooden steps going all the way to the top giving you a great 360 degree view of the space and all the vineyards around. Though the family serves wine, they have long since stopped producing their own label. After a lovely lunch, we set off to another wonderful sight - Göttweig Abbey. This is a Benedictine Monastery that was set up in 1072. It was burned to the ground in 1718 and was rebuilt in a grand manner by 1749. Besides the amazing artefacts that are woven into every room of this massive monastery, is a library, not open to the public which houses over 130,000 books. The library is accessible only to the monks and is not lit up with any artificial lights, for fear of damage to the books. Set atop a hill, the Goettwig Abbey is a majestic structure housing several smaller chapels and buildings within. Most of the wine history of Austria and Vienna lie within the walls of monasteries where priests were believed to be the bastions of knowledge and science and therefore able to make wine. This culture continues to this day. The wine tasting was followed by a short guided tour around the palace. We had a lovely guide who took us on a brisk walk through the palace and what struck me the most was the artistry that is woven into the palace. From frescoes, to murals to lighting fixtures, tapestries, artistic windows, the palace is replete in art that represents different decades of its creation. The view from one of the many balconies at the Abbey. Click on the image above for more pictures at the Abbey. Shopping at the Abbey's curio shop saw me missing the bus and having to, rather red-faced, being ferried in the accompanying cars of one of the organizers from AWMB. Apparently experience with earlier summits has shown them that there will always be stragglers, and those forgetting cameras, bags and more at locations and these cars do the needful. Perfect lesson for me to keep an eye on the bus going forward! We were ferried to the Arte Krems Hotel which was where we were staying for the evening. The hotel is big on glass corridors and facades all through the building. The room, has a rather large bed and work desk area. What I noticed in most bathrooms in Austrian hotels were that all your toiletries are now dispensed out of bottles that are fixed to the wall. This video below will give you an idea of what my room looked like. 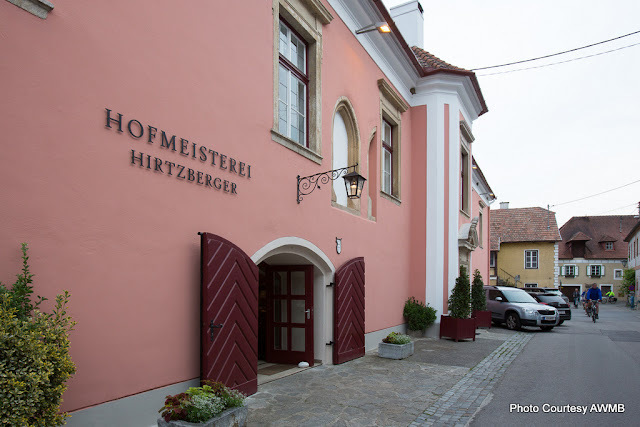 After a two hour break to refresh ourselves, which I now regret not wrapping up sooner and heading to the pub below, we set off to Hofmeisterei Hirtzberger in Wachau. A lovely drive from our hotel in Krems, alongside the Danube River led us to the maroon twin doors of the restaurant. Our group of around 30 walked past a softly lit restaurant with its many displays of wine bottles of the region. The exposed brick walls and soft lighting created a calming atmosphere, perfect for those patrons looking for a lingering meal over a glass of wine. Since we were there on another mission, we were taken to a downstairs hall, set up with round tables and individual placings that told us we had an interesting meal to look forward to. Our curated wine paired meal was hosted by Peter Schleimer, the Chief Editor of Vinaria. You can read all about that experience in a detailed blog post here. The end of this meal spelt the end of the day for us. It was a long and enjoyable one and my bed really called out to me. In case you have landed here directly, you may want to read Day 1 of my Austria Visit.